George Clinton & Parliament Funkadelic appear Thursday, Feb. 8 at the Keswick Theatre in Glenside. In order for hip-hop modernists such as Kendrick Lamar, N.E.R.D., and Flying Lotus to have found the funk at the heart of their sound, George Clinton had to make it first. 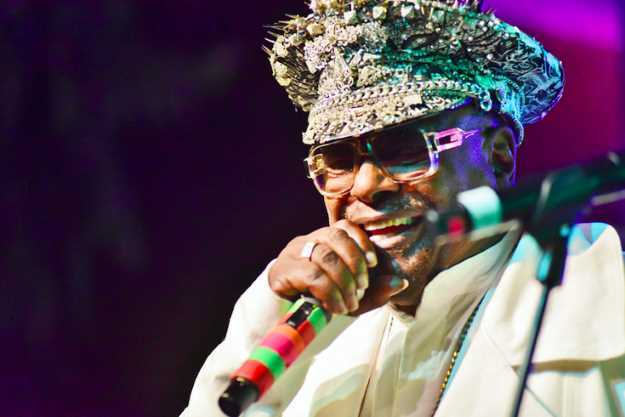 Whether alone with "Atomic Dog" style or together with his bands Parliament and Funkadelic, the always innovative Clinton kept the grooves deep, the melodies contagious and the intentions nasty throughout the 1970s and 80s. There hasn't been a P-Funk production in some time as Clinton has recorded and toured under his own name for decades. Now, he's remedying that situation with his first new Parliament studio album in 38 years called "Medicaid Fraud Dog," featuring new members such as his grandchildren and P-Funk's original horn section. He'll give it a Mardi Gras showcase at the Keswick Theatre tomorrow night. PV: Before you started your career in funk, you had a barbershop and a career in hairdressing and straightening hair. When was the last time you did hair? GC: (Laughs) Well, I always had the funk, even before I made music. As far as doing hair, it has been a while outside of making up my own styles. PV: Before there was Parliament or Funkadelic, there was The Parliaments – your doo-wop act. Why did you envision your first band as such? GC: When we first started, Frankie Lymon had just had a hit with "Why Do Fools Fall in Love." From there, you had The Spaniels, The Platters, The Moonglows and all the R&B acts of the 1955/1956-era adding that brand of harmony to their sound. That's what got me into wanting to sing in the first place – that sound. The Shirelles were even neighbors of my cousin's, so I watched them rehearse. By 1960, however, Smokey Robinson and the Miracles showed up as Motown started, and that changed the game. So, we wanted to be part of that. PV: How and why then did Parliament turn psychedelic and overtly funky in its sound and brand of costuming? GC: The British Invasion comes to mind, especially The Rolling Stones. I even worked with Jimmy Miller who produced Traffic and several Stones records. The psychedelic thing was just starting up, and we had a lot in common with the English movement at that time. I loved King Crimson and psychedelic blues. Besides, once I had a hit with "Testify," I knew I had to keep peoples' imaginations titillated, so we changed. We spun a 180 on them with Parliament and Funkadelic. And along with all the British stuff, we were very inspired by the whole New Orleans thing – say, the Meters – and putting the emphasis on the rhythms. That's important. We did the "hoo ha hey" chant and got really draggy. PV: Apt for your Mardi Gras gig in Philly. How important was free jazz and cats such as Art Ensemble of Chicago and Philly's Sun Ra to your mix at that time? These guys, in particular, because they dressed the part? GC: You just answered that. It was a mix – with the jazz, the rock, the blues, even church music, all blended together. Jimi Hendrix opened a lot of doors as he helped put an emphasis on the music rather than the singing. Rock guys, such as he, were starting to do solos just as jazz guys were. The drugs made it all possible – LSD and mescaline and the MDA. We just made it all nasty, dark and dragged out – that became our niche. PV: Fast forward to 1980, when you shut down production on albums by Parliament and Funkadelic with 'Trombipulation,' being the last Parliament album until the new record. Was it all just a business thing that kept you from recording under those names? GC: Yes. [It was] the labels and the management that I had at the time. I'm still in court about that period and we're filming a documentary about that now. I'll be getting that story out soon. Everyone assumed it was all drugs. That was a tiny part, but it was mostly business woes. PV: So, you got yourself straight and got married. After that, what was the first thing you wanted to do with the music? GC: Once I made myself relevant again, I decided that I wanted to make other artists relevant, and that meant my son, my daughter and my grandchildren. It was they who hooked me up with Childish Gambino and Flying Lotus, which got me back in the flow of things. The juices started flowing. Once I put that first new Funkadelic album out (2014's "First Ya Gotta Shake the Gate") and get the Parliament record released – I'm doing another P-Funk All-Stars record. After that, I'll be putting out albums from the grandkids. PV: So why, after 38 years, does a new Parliament album have a medical theme in "Medicaid Fraud Dog?" GC: We been high up in this medical thing for a while. Obamacare, pharmaceutical warnings, steep drug pricing, opioids. Used to be all we had to worry about was some bad Tylenol. Now it's everything. The legal pharmaceutical companies are taking over where the ushers left off and with the government behind them. That's some bad business.